Beards are the ultimate manly trend nowadays. All celebrities and fashion icons are showing off their beards and their styling techniques. Well, these trends can be challenging for men like me, whose beards don’t grow in as a whole but instead choose to appear in patches everywhere randomly. How to Fix a Patchy Beard: Do beard supplements really work? If you are one of those men, you know the real challenge of trying your best of evening out the beard and finally just giving up and shaving it all off. We cannot even blame ourselves or our lifestyles; it’s entirely genetic. That’s why I envy many others. They just grow it,and it looks perfect while for us, it’s a real struggle. Still, battles are meant to be won. That’s why, in this article, I’ll talk to you about all the possible ways to fix a patchy beard. Lipogaine is made up of mainly biotin, caffeine and argan oil. All these elements enhance hair growth. Biotin is a natural vitamin found in egg yolks, bananas, mushrooms, soy and organ meats. Caffeine is a strong hair growth factor too. Every morning, you’re doing your beard a favor by drinking that delicious coffee. Combine all these elements,and you’ll have a reliable product that works on everyone and not only beards. Even cancer patients swear by it. In a nutshell, the conditioner aims for healthier skin and pores which in itself results in healthier and stronger hairs. This is an all-natural product that requires at least six weeks to notice the results,but it’s actually worth the wait as it enhances hair growth drastically. It’s composed of Biotin, Niacin, Kopyrrol and some essential oils. These substances promote hair growth naturally. Usually, men focus the spraying on the empty spots of the beards. This is an all natural product filled with amazing nutrients that help the growth of the hairs like Biotin, rosemary oil, tea tree oil,etc…. Rosemary and the tea tree oil are particularly beneficent because they prevent acne, dandruff and skin damage plus they stimulate the hair follicles. If you are a regular daily user, you’ll start seeing results after the first two weeks. The right way to use it is to rub your beard with a dime sized amount then just wash it off with some lukewarm water. So, it can be used on the beard, eyebrows and even chest. But, you might notice unwanted hair growth on the back, upper lip or forehead. In the tropical forms of shampoo or foam, the side effects are rare while on the pill form, it can reach the bloodstream,and that’s where the danger is. But, the Minoxidil is the most efficient way to fix a patchy beard. My only advice is to use it with a moisturizer because it might dry your skin off. Visual effects: trick people to believe you have a think-haired beard with your cheek line. Angle the cheek line,so it just goes through the hairiest part of your jawline. These tricks may be temporary or very risky, so I recommend trying the supplements and products that stimulate hair growth instead of just covering up the patchy beard. You need to know beard growth stages to understand if any of the mentioned products are working or not. This is the first stage. You’re still at the beginning of the process. Nothing much to do here. At this point, the beard is probably patchy,and you’re wondering whether the products are working or not. Don’t worry, your hair will grow into those patches,but if you start feeling itchy, then it’s time for the facial oils. In this week, the beard has grown into a full attractive beard. But, don’t let that growth tempt you to start trimming it. The least bit of slip up will undo all those six weeks. Instead, all you should do is buy a beard’s shampoo and begin shampooing it and taking care of it like your head’s hair because, at this length, it collects dust, oil,and dirt. Wash it off twice or 3 times a week. If you have a patchy beard, don’t worry. All those spots and patches can just be fixed with specific products made for us. If you don’t want any supplements, then you still have a choice. 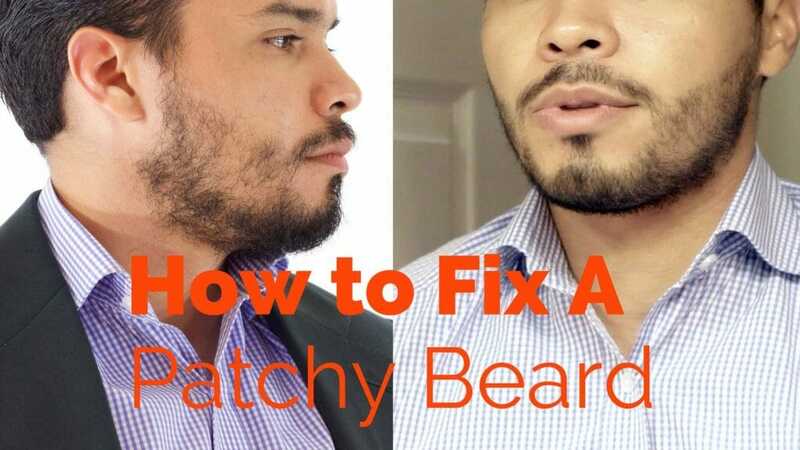 There are many tricks to cover up the patchy beard too. Follow the trends, have the beard you’ve always wanted.